Southern Utah Table Tennis Club is located in Ivins, Utah, USA. We welcome visitors of all skill levels, but you must be 18 years or older to play and must sign a liability waiver. Club members must pay a $3.00 fee and visitors must pay a $5.00 fee. We are open Saturdays from 9:00 am until 1:00 pm. We play in a lean heated/air conditioned build with high ceilings and excellent lighting. There are currently 14 members, but we also have visitors who come most weeks. There are no leagues or competitions. We have open play. Winner keeps the table. Others challenge in. Coaching is not available. 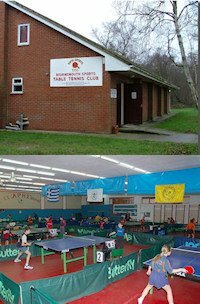 This is a clean, well lit location to get together with others who enjoy playing table tennis. There was nowhere to play table tennis in the area. The club president who moved here from the Pacific northwest contacted the City of Ivins to see if we could use the recreation building at the park. They agreed and the club was formed. No website is available, but we do have information on Facebook. Just search for the Southern Utah Table Tennis Club.